Big meals that are high in calories and fat can trigger heartburn or make you feel uncomfortable. Caffeine. One of the biggest culprits for keeping people up late at night, caffeine should not be consumed 3 to 8 hours before bedtime. Why? Caffeine is a stimulant and wakes up the central nervous system. Alcohol. Even though a little bit of alcohol may make you drowsy, too much alcohol may wake you up in the middle of the night. Salmon and halibut provide vitamin B6, which is needed to make melatonin. A light snack may help produce serotonin. 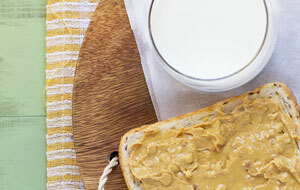 Try eating a banana with 1 teaspoon of peanut butter, 1 cup of cottage cheese (contains the amino acid tryptophan), a small bowl of oatmeal with a chopped piece of fruit, or a slice of whole wheat toast topped with a slice of low fat cheese. Drinking a glass of warm milk is a great soother before bedtime. Aside from foods and beverages, exercise may help improve sleep. Getting enough shut eye is important for good health—from keeping your immune system strong to keeping your brain sharp to keeping you happy!